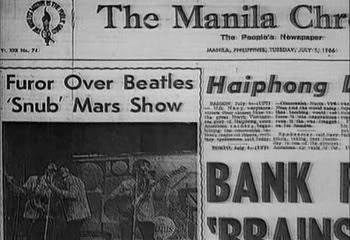 When the Fab 4 woke up on the morning of July 5, 1966, they knew something was going on in Manila, but they weren't totally sure what. They tried to order some breakfast, but did not get any response from the hotel management. So they asked Mal Evans to go down to the desk and see what was going on. When Mal got to the lobby, he found the hotel to be totally empty and then he saw a newspaper and realized why. The variety of headlines said everything from "Imedla Stood Up" to "Beatles held for taxes." At 8 am, the Internal Revenue bureau was knocking on Brian Epstein's door with a bill for $80,000. Vic Lewis, who had made the arrangements with the promoters, explained to the officials that it was the promoter that was responsible for paying the tax on the concerts and not the Beatles managers. Brian also had not received any money at that point from the promoters for the concerts and didn't want to leave without the money they made. Meanwhile, George and Paul were being interviewed in the suit by a reporter for the Manila Times, who had planned all along to do a multi-part series about the Beatles for the paper. Paul told him, "We don't want to offend anyone, especially since we're visiting this country. We just want to sing." However George simply said, "We didn't even want to come here." 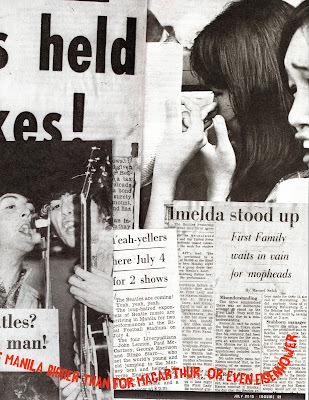 But Paul then made what could have been another mistake for the Beatles---he started to question the reporter about the poor people he had seen in the streets of Manila the early morning when he explored. He stated how there was social inequality in the country because the extremely wealthy were bragging of their wealth with the fancy yachts and all the while there were people living on the streets nearby. The reporter didn't seem to want to discuss any of that and told Paul that the Beatles could have solved the problem and make people happy if they had only agreed to move the meeting at the palace to later in the day. Paul was quoted as saying, "We weren't supposed to be there in the first place. What were we going to do? Show up and say, 'We're here! Sorry we're late!' Why should we apologize for something that's not our fault? We didn't ask for the appointment." The reporter simply explained that an invitation from the First Lady "amounted to an invitation from one who represented all the people." John walked in at this point and sad something, "We got a few things to learn about the Philippines, first of all is how to get out of here."